Metro's Historic Zoning Commission has approved the Ryman Auditorium’s request to build add an outdoor stage. NASHVILLE, Tenn. (WTVF) — Metro's Historic Zoning Commission has approved the Ryman Auditorium’s request to build add an outdoor stage. 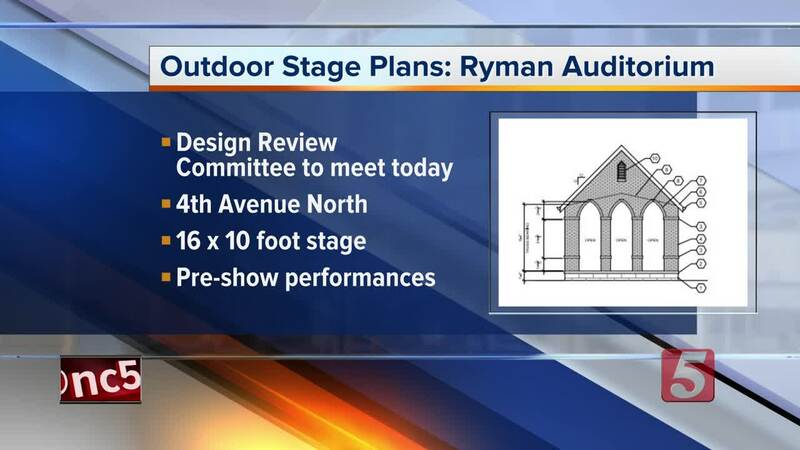 The Ryman hopes to build a covered stage at the existing outdoor space on Fourth Avenue just off of Broadway. The plans include a 16-foot by 10-foot stage that will essentially look like a mini Ryman stage. The space would be used as a spot for pre-show performances. The construction would not impact or alter the interior of the Ryman Auditorium. There's a meeting with the Design Review Committee to take up the request on the agenda at their Tuesday morning meeting.